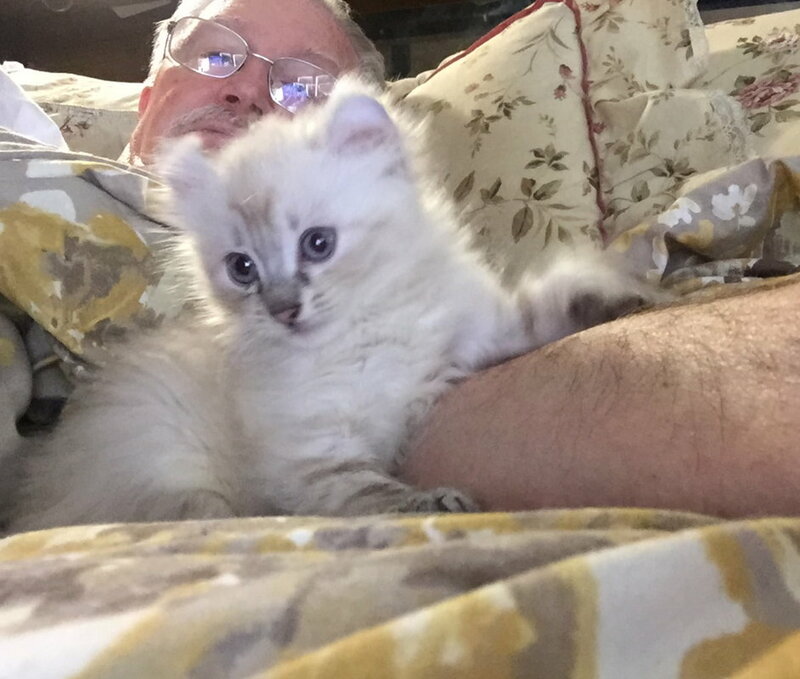 Little Tiffany is a female blue lynx point kitten for sale now. These are her first photos. 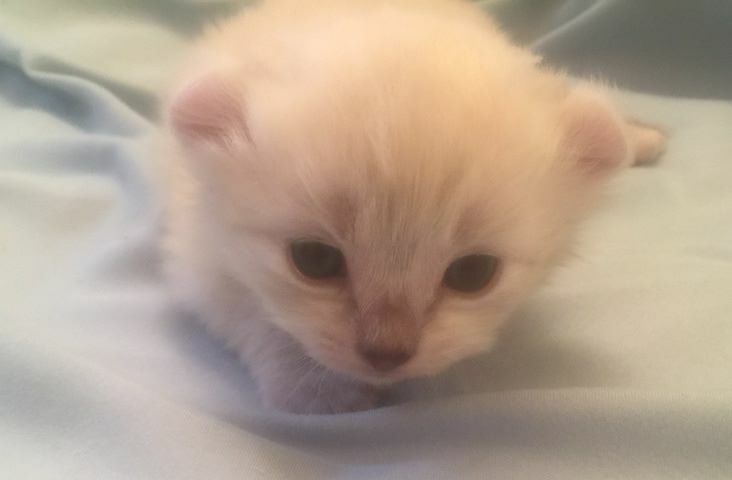 She is 3 weeks old. 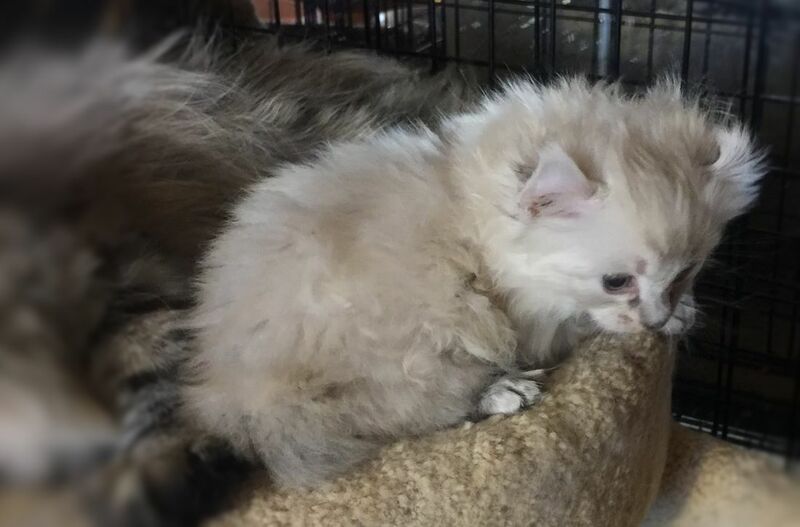 She will be available to go to her new home sometime mid to late April. 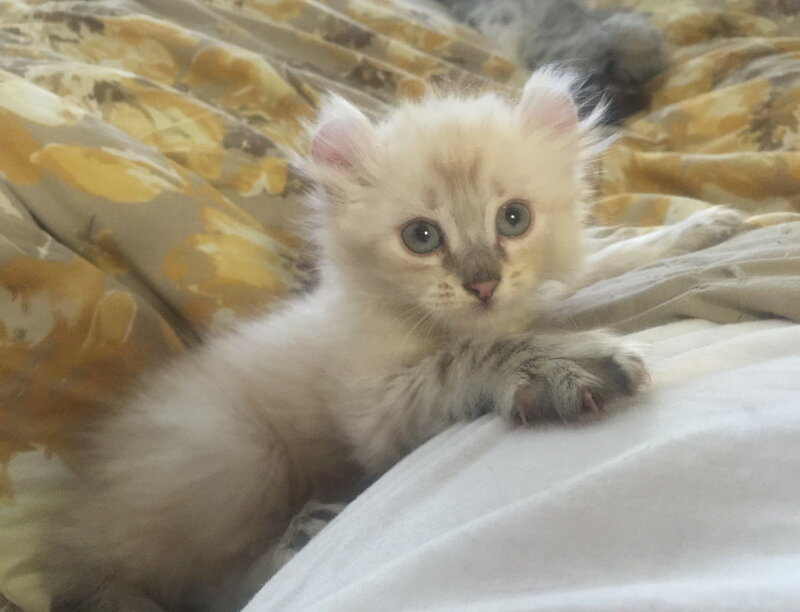 ​You can just start to see the faint coloring on her feet and ringlets on her tail. I pulled Tiff away from mom just long enough to take her into the bathroom where there's more light to snap these pics. She was squirming all over the place wondering where she was. I didn't want to keep her away from mom too long. 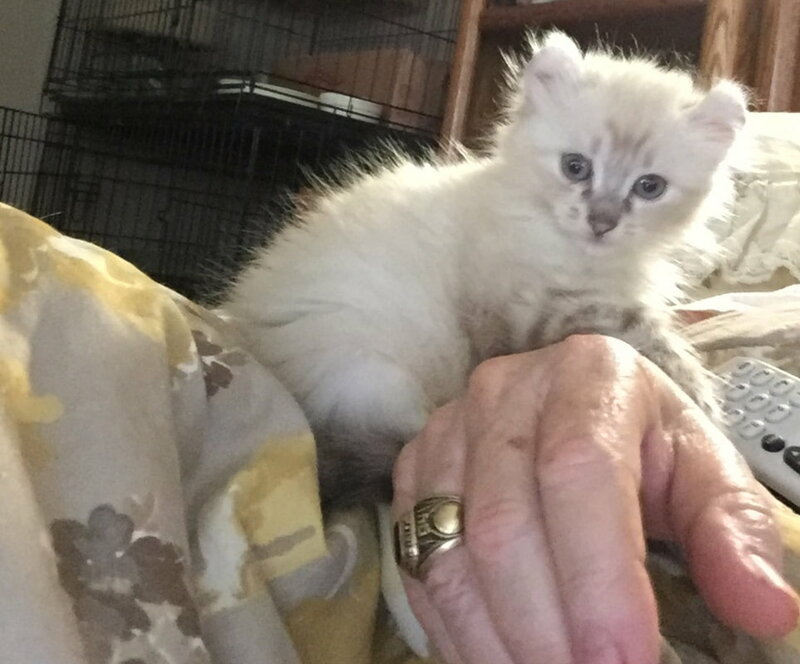 We'll get some better pics up in a couple of weeks when she's a little older. Below are photos of little Tiff at a month old. We haven't even tried to wash he or fluff her. It would be a waste of time. Mom baths her from head to toe at least once a day. We'll go in and find her soaking wet from mom's licking all over her. These two videos were taken on 2/15. 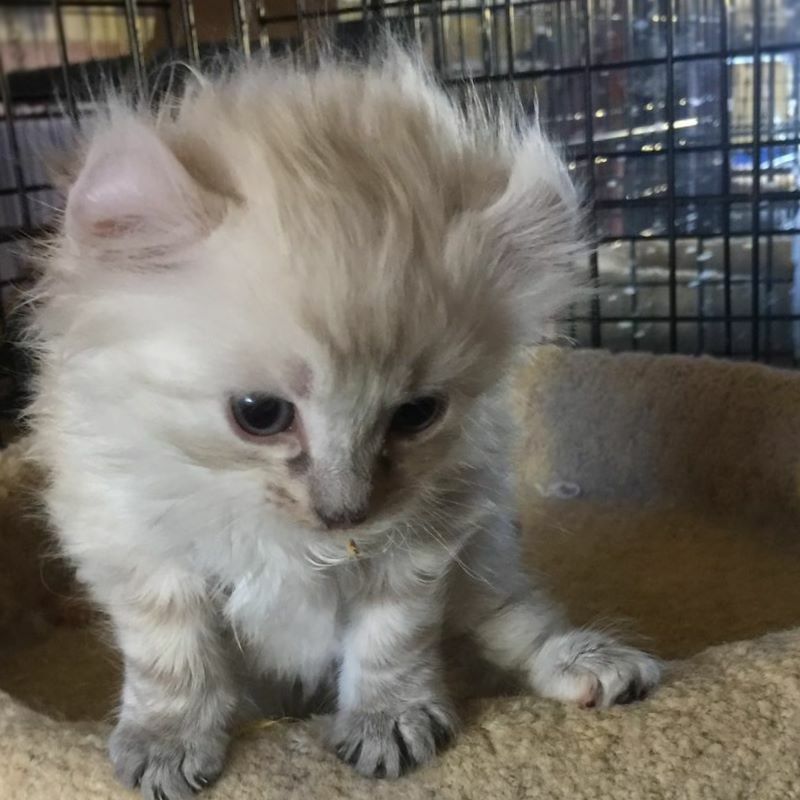 Tiffany is all of 6 weeks old. We need to move some kitties around to make room for the show cats this weekend so we decided to move Tiffany and mom into the master bedroom cage. Little Tiff is soo soo affectionate. We've handled her so much since she was born that she wants us picking her up all the time now. We won't let her have the run of the room for at least another couple of weeks. The first photos taken at 3 weeks and the ones above at 4 weeks, plus the videos below taken at 6 weeks shows how the babies change as they grow. In the videos, I tried to show this cage from different angles. I move the camera out of focus in the first video when mom looks like she may want to jump out of the cage. It's important for us to clutter the cage with all the carpeted surfaces so the babies can stretch their legs to strengthen them, but also so they have something to dig their claws into with they start to fall. We've had babies at about this age fall and break their neck from the to ledge in the past when we didn't have all the padding for them. The larger circle is "well worn" but I can't get another one like it and it's the perfect size and shape for my purpose to protect the babies when we move them to these cages with the higher platforms. Hope you enjoy the videos.